Wallace Hall's future at the University of Texas System turned clearer on Monday: Lawmakers scolded the embattled regent but decided to keep him around — for now, at least. 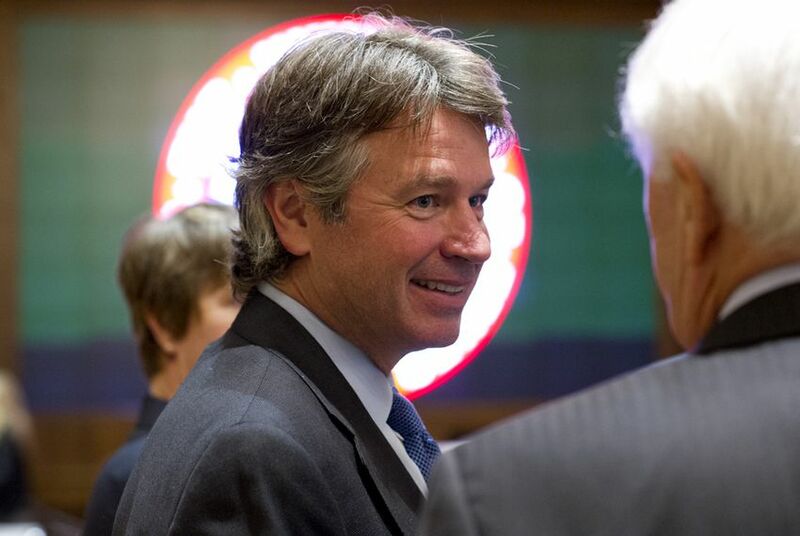 Wallace Hall's future at the University of Texas System turned clearer on Monday: Lawmakers publicly scolded the embattled regent but decided to keep him around – for now, at least. After a year-long investigation into a saga that has roiled Texas politics, the House Select Committee on Transparency in State Agency Operations voted 6-1 to admonish and censure Hall for “misconduct, incompetency in the performance of official duties, or behavior unbefitting a nominee for and holder of a state office.” Those charges related to Hall's drawn-out investigations of University of Texas at Austin administrators and his handling of private student information. Hall has alleged the university has allowed lawmakers to unduly influence the admissions process. Ahead of the vote, the Tribune's Reeve Hamilton reported that the committee had several options, including "voting on articles of impeachment against Hall, waiting on the results of a separate criminal investigation, issuing guidelines for all regents or considering another type of reprimand." Though the lawmakers stopped short of pushing for impeachment, co-chairwoman Carol Alvarado, D-Houston, did not rule that out as a future option. “A vote to censure is not a vote against impeachment,” she said, according to Hamilton's report. With its decision, the committee "appeared to have found a middle ground between inaction and impeachment that reflected a certain political calculation," wrote Ralph K.M. Haurwitz of the Austin American-Statesman. "Censure is a public statement of disapproval, whereas a recommendation for impeachment by the full House would have triggered a new round of review and potentially a trial in the Senate to determine whether Hall should be removed from the Board of Regents." Hall, who has denied wrongdoing and suggested his actions fell within his job description, issued a statement calling the committee's findings "based on distortions, untruths, and intentional misrepresentations." Gov. Rick Perry, who has defended his appointee amid the investigation, said in a statement that he hopes the vote "closes this ugly chapter and Regent Hall’s critics can stop wasting time and start focusing on what’s important — ensuring higher education is affordable, accessible and accountable to all Texans." The Associated Press' Jim Vertuno noted that the committee spent more than $500,000 on the investigation. Meanwhile, system officials said Monday that they had hired an independent firm to investigate the admissions process. Marissa Barnett of The Dallas Morning News reported that "the focus of the current investigation will not be on letters of recommendation written by legislators or other external letters of recommendation, but in the admissions process and handling of applications." • The Texas House Select Committee on Economic Development Incentives will meet at the Plano Municipal Center to discuss the Texas Enterprise Fund, Emerging Technology Fund and other incentives. • The Texas Senate Committee on Finance will meet to discuss the budget process, general revenue outlook, Texas economy, constitutional spending limits, the Economic Stabilization Fund, methods of finance and border issues impacting the state budget. • Health Care: What's Next? : Tribune CEO and Editor-in-Chief Evan Smith will lead a discussion with two of the Legislature's most respected thinkers on health care, state Reps. Garnet Coleman and John Zerwas, on Aug. 18 in Richardson. The event is free and open to the public, but an RSVP is required. • The Texas Tribune Festival runs from Sept. 19-21 at the University of Texas at Austin.